Great to see you're making progress! There's only one glitch, and that's the misspelling of "Touhoumon" at one point in the video. Looks amazing. Supposed to be spelled without the "U"s. At least for now, until I can find a way to hack the "POKE" text abbreviation, which I heard requires using ASM. It’s simple: find the “POKé” string in the ROM and repoint it. If “POKé” string is repointed though and made Touhou for instance, there will be text glitches everywhere. This is exactly the issue I was concerned about. Although I would probably use a different term altogether (I don't recall playing any GBA version that explicitly called them "Touhoumon", usually just "Touhou", "Puppet", or some variation of it like "Boneka"), the fact remains that I'm trying to avoid glitching up the text, or causing other issues. As it currently stands, I already edited that string to generate the word "Toho" for every instance of the POKé bytes, and it will remain like this until I decide on a good solution. I'm currently done with about 70% of the battle sprites now. I'm also highly suspicious that AgiXP might be responsible for a game-breaking glitch I recently encountered, which is part of the reason I've shifted my focus for now. Thankfully I had backups of my ROM, but this glitch was particularly troubling--it was literally affecting spots of code in the ROM (like affecting a chunk of the move/evolution tables). I already know for a fact AgiXP does some weird stuff, like affecting the Sp.Def base stat of the Pokemon you inserted for, so I'd like to know what other quirks people have encountered with it just to make sure. Make a patch file using the latest working rom as the Unmodified ROM file and first glitch one as Modified and see what's changed between those two. Right now, I'm currently putting together the 'Dex entries, since I've figured out how they work and how to set them up. I'm actually halfway done with them, and I expect to be finished with this step very soon now that I'm well aware of line character limits and such. I've also finished with the battle sprites, and have begun the lengthy insertion + colorfix process. I consider them to be 99% complete though at this point, simply because there could be room for improvement. If any experienced spriters feel like doing touch-ups (for example, adding highlights to hair, improved shading, etc. ), I'm willing to lend them over. I am so excited about this. GAH. I can't wait to put this on my DS and play this all the time, everywhere. -Trainers. I set these up as I play through the hack. -NPC dialogue. Again, I do this as part of the playtesting. -And a bunch of graphical work. Namely, setting up the title screen and making overworld/menu sprites to replace the Pokemon's. I managed to set this up (Big thanks to whoever made the original, I just reduced the color count). Now I just gotta set it up for insertion. There are some minor things, like adjusting what items Moon/Fast Balls work on, Fishing encounters, and stuff like that, but I expect I'll have those down quick after a bit of searching. I know several people are keeping an eye on this hack, and I'm usually getting asked about it every few days now. Just be patient--I hope to have a beta released very soon. I can't say exactly when, but I'm hoping within this month if things go smoothly. Any chance of making the player a female rather than a male, or changing the sprite at least? It's not of huge importance, but it'd be fitting for Gensokyo. Already taken care of. Those preview screenshots are almost two months old now, so I guess I should post the new trainer's sprite soon. Since it's been some time since I've really said anything, I guess I might as well make a few things known. 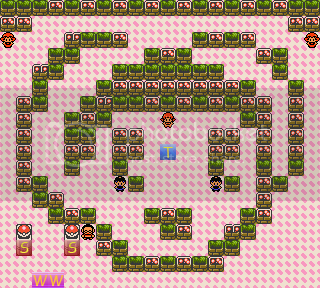 First, in regards to actual progress on the hack, I've gotten everything up to Ecruteak City set up. I've been primarily focused on making sure things work right, and squashing any bugs that I encounter. 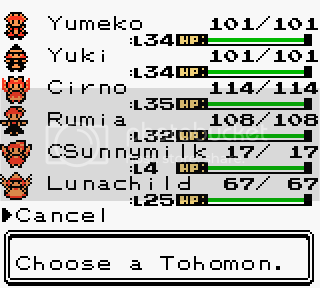 Second, I am officially naming this hack Touhoumon: Ordinary Version. "Ordinary" refers to how Marisa Kirisame considers herself to be an "ordinary witch". Third, the starters have been determined! Funny story. 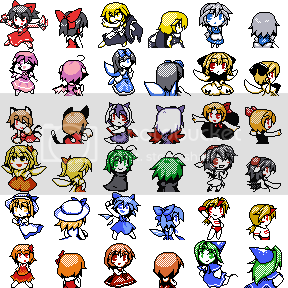 Originally, I was going to follow suit with most versions of Touhoumon, and use Reimu, Marisa, and Sakuya for starters. After having some talks with friends who had played the GBA Touhoumons before. We eventually came to the conclusion that it just wasn't a balanced triangle to begin with, so I came up with a new one which you see here. Don't worry--Reimu is still obtainable elsewhere in the game, for those of you Reimu fans. I also promised some screenshots last week, well here they are! Really old pic, since the player sprite uses a different palette now. This is the entrance to Spr--I mean, Autumn Tower. Also got the Bicycle sprites up. It's actually brewed with injustice, so he's lying. Nothing tastes good when it's made from injustice! Being the baka she is, Cirno naturally learns how to Headbutt. Also demonstrating the revised Headbutt encounters table, and the Trainer backsprite here. This is a message you will soon learn to loathe. Revised prize list for the Game Corner. Notice that one of the prizes is a starter (Alice). In this hack, there are opportunities to catch or obtain the starters later on. I felt like I should reply something to the thread as you've really done nice progress there! The thing for me is though that I don't think I'll enjoy playing this hack that much. It's just that I don't even know what Touhoumon is and using them in battles is confusing when you've no idea what moves each one of them learns and what type they are. I'm going to play this when you get it released though. Who knows, maybe I'm just imagening it's going to be like that and I'm all wrong about it. I can understand where you're coming from. Back before Pokemon Red and Blue even hit the shelves, a good amount of people who were looking into playing Pokemon already had some prior knowledge of the games, partly due to things like Nintendo Power's brief run of the Pokemon Power sub-magazine, the Pokemon anime that was being aired at the time, and a lot of other information sources that were out there. From that point onward, the information was just always there, even for the newer generations, so there was rarely an issue of unfamiliarity. Even if you didn't look up stuff prior to picking up a game, it was usually easy to guess through experience what type most Pokemon were simply due to their appearance and what moves they used. 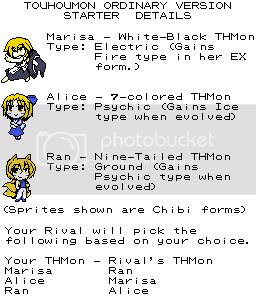 With Touhoumon, that familiarity isn't really there; unless you're familiar with the Touhou series, you might find yourself having to learn other's types the hard way, through actually fighting them and catching them as your own. I also designed this hack with a higher difficulty level compared to the original GSC with a slightly higher level curve, better trainer scaling (no Team Rocket Grunt with five LV20 rodents in Goldenrod) and tougher Gym Leaders. I will say now that almost all of the characters are endgame-viable; this isn't like Pokemon where those little rodents and bugs you find early on are vastly inferior compared to the monsters you find in the later game. Even early-game finds like Chen and Mystia have the potential to be very good later on, so who you use on your final team all boils down to preference. Their effectiveness until then varies; Rumia for example is pretty bad until she learns Faint Attack at LV15. With that said, I may end up including some more resources along with the hack; I've already gotten a revised Type Matchup Chart to be included along with the patch, and an FAQ that should answer several questions regarding certain things. My god, everything is amazing! I was literally screaming with joy looking at the new preview pics. I can't wait to play this. Another week, another status update. Everything down the Olivine/Cianwood path is ready, with the exception of the Whirl Islands caves. I'll get to those later. A friendly warning; since the Ice-type has more of a pressence in this hack compared to most Pokemon titles, getting frozen like this isn't a super-rare occurance. In fact, freeze can occur as early as Route 32 if you're really unlucky! One of the new/modified moves in this hack is Blade Flash. It's a Steel-type move that has priority. Why is there also a picture of Flash being used? That's because it is now a 50BP Psychic-type move that also has a good rate of lowering Accuracy. Mystia taking revenge upon the hungry ghost. Jasmine's lineup consists of blade-wielding characters. Yumeko vs. Sakuya! Who is the better maid? I think that's enough for screens. I know some people are itching for the eventual release of this hack. I'm going to state right now that it's coming soon, at least a beta version. It will likely include everything up to Blackthorn City revised. -Where is the byte that determines which Pokemon turns held Berries into Berry Juice, which eventually turn into Rare Candies (normally Shuckle)? -How would I go about editing the Reading Slowpoke graphics in the Pokedex? I've drawn up a nice replacement, but the color placement on the original seems odd in contrast to how it actually appears in-game. Okay. I'm VERY close to releasing the demo version of Touhoumon Ordinary Version. With all of the content up to and including Blackthorn City, I feel the time to release something draw near. There are just a few things I need to take care of, and I shall. The first of these is Menu Sprites, which I've ended up having to do myself. Here's a preview of some of them. Next, I've looked over and touched up the learned moves table. This, of course, means I must repoint the entire thing since several moves were added and removed throughout the table. Finally, I need to make sure all the battle sprites display correctly, make sure the Sp.Def stats on all Tohomon are correct (AgiXP has an odd quirk that reassigns the Sp.Def stat of a Pokemon to the hex value of whatever the dimensions were), and check all the fishing encounters I've set up. Release a beta version, please. I can help iron anything out that I see wrong with it. Ah... I see. Very useful trick now that I know, saves me considerable time in adjusting colors. Anyways, here's some of the sprites I've got so far. Fun fact: All of the characters you see here, with the exception of the first three (the starters) are obtainable prior to the battle with Falkner in Violet City. Also, that Reimu was done by someone else. On another topic, I've been looking into some of the other GFX in the ROM through Tile Layer Pro, making various edits here and there. One thing I came across was the Poke Ball sprite that's thrown during battles. I was going to change it to the Yin-Yang Orb, but it looks like there's no other half to the ball... leading me to believe this sprite is mirrored. If anyone could help me write a new GFX routine for the ball, I'd be very grateful. You did good in your sprites but I can make them look smooth, and make better one if you need one though I havent tried making things like this though, But I guess things maybe change.. I've been rather quiet about this haven't I? It is summer after all, so I often find myself getting roped into other activities. I assure you I have not stopped working on the hack; I really do want to release this. One of the things that has been going on behind the scenes is resource compilation. With the help of a good friend of mine, who goes by the name IdiotsOpposite at the Touhou chatroom I frequent, he's compiling a complete Tohodex, which includes vital data such as Types, Base Stats, Learned Moves, Evolutions, Locations, and other data. It's still a work-in-progress, but most importantly, he's gotten all the learned moves and evolutions down, and I've been cross-checking with my data so I could finalize the move/evo pointers. I myself also took the liberty of making a comprehensive list of new and edited moves. I'm also checking all the sprite graphics to make sure nothing is glitched or game-breaking before I release the demo--during earlier playtesting, a lot of Trainer sprites were glitched. My guess, I must've input a bad location for a sprite a while back when I was doing all those manual inserts. As a matter of fact, I'd gladly take you up on this offer. There are a lot of sprites that didn't quite turn out as well as I had hoped, either because they ended up lacking an illusion of depth or whatever. Once I release the demo, feel free to take a look at the sprites and let me know who you plan to touch up. *Although to be fair, I wasn't even registered here when he made the statement. Okay. It's finally ready: the demo release of Touhoumon: Ordinary Version! -Content up to and including Blackthorn City is open to the players. -Almost all non-legendaries are obtainable. If I forgot someone, let me know. -The legendary Tohomon at the bottom of Whirl Islands can be fought and captured. -Ruins of Alph events/interior encounters. You can still catch Tohomon in the exterior area, some are exclusive to that spot. You can find the download for this hack on the front page. Be sure to apply the IPS patch to a Silver ROM! This could probably be moved to the hacks section now, assuming the hack is working as intended.